The Lion King tells the story of Simba - the epic adventure of his battles, his friendships, his dreams and his journey from wide-eyed cub to his destined role as King of the African Pridelands. It's the costumes and puppetry at the Lyceum Theatre that have made this one of the most successful musicals of all time as a whole menagerie of wild beasts are created from masks, stilts and superb dancing. Memorable moments from the film such as Mufasa appearing in the clouds and Timon and Pumbaa singing Hakuna Matata are even more magical on stage while Brown Lindiwe Mkhize's take on mystical baboon Rafiki steals the show with her renditions of He Lives In You and Circle of Life. The ever-changing set and the addition of Zulu chants to Elton John and Tim Rice's catchy songs all add to an extraordinary atmosphere - if you can, get seats in the stalls to ensure you're fully surrounded by the magic. 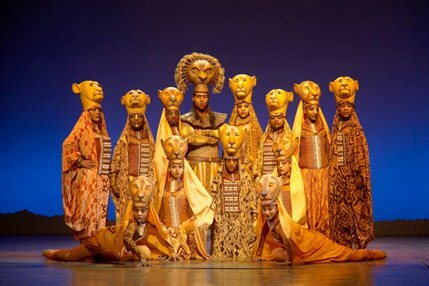 A staple on London's West End, the production is a triumphant, genre-defying adaptation and one of the few family plays that is genuinely as much fun for adults as children.NB: The Lion King is recommended for ages 6 and up, children under the age of 3 will not be admitted into the theatre and all persons aged 16 or under must be accompanied by an adult and may not sit on their own within the auditorium.